Here is a wonderful rendition of 2 classic songs by one of the most gifted and versatile singers of all times, the great Georgia Gibbs (recently deceased), "her nibs" in person, as she would be called! Georgia Gibbs (1919 - 2006) was an American singer, most popular in the 1950's. She was born Frieda Lipschitz in Worcester, Massachusetts, of Russian Jewish immigrant parents. She revealed a natural talent for singing at a very young age. 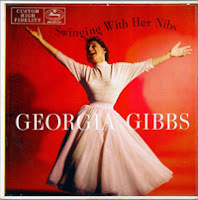 Gibbs began her professional career at the age of thirteen, and was singing in Boston's Raymor Ballroom the following year. Gibbs freelanced in the late 1930's and 1940's singing with the bands of Frankie Trumbauer, Hal Kemp, Tommy Dorsey and Artie Shaw. 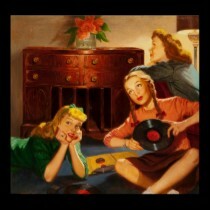 It was with Shaw's band that she scored her first hit, "Absent Minded Moon" (1942). In 1943, she began appearing on the popular Camel Caravan radio program, hosted by Jimmy Durante and Garry Moore (it was Moore who bestowed the famous nickname "Her Nibs, Miss Georgia Gibbs" upon her). She was a regular performer on this show until 1947. Gibbs signed with Majestic Records in 1946. During this period she also was the featured singer on tours with comedians Danny Kaye and Sid Caesar. Miss Gibbs had a natural talent for comedy as well, and worked well in support of the immensely popular Kaye. 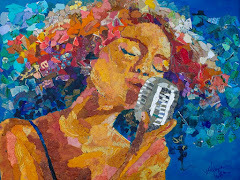 She had a big, old-fashioned voice, a good ear, a vivacious personality, and she knew how to sing from the shoulder. Possessed of a versatile voice, she cut a long list of great records in every category from torch songs to rock-and-roll, to jazz, swing, old fashioned ballads and cha-chas. Her most successful record was "Kiss Of Fire" which reached the #1 position on the pop music charts in 1952. It immediately became one of the defining songs of the era. Sultry and throbbing, with a touch of vibrato, Georgia Gibbs' voice is best showcased on romantic ballads and torch songs. Gibbs continued to be a frequent visitor to the charts throughout the first half of the decade (with over 40 charted songs), and was briefly successful doing rock 'n' roll songs as well. She appeared on many television shows throughout the decade, including the legendary Ed Sullivan show, and hosted one of her own, Georgia Gibbs And Her Million Record Show. She cut her final album, "Call Me" (1966) and rarely performed after that. However, in recent years, her reputation steadily grew - partially due to the availability of her songs on CD.